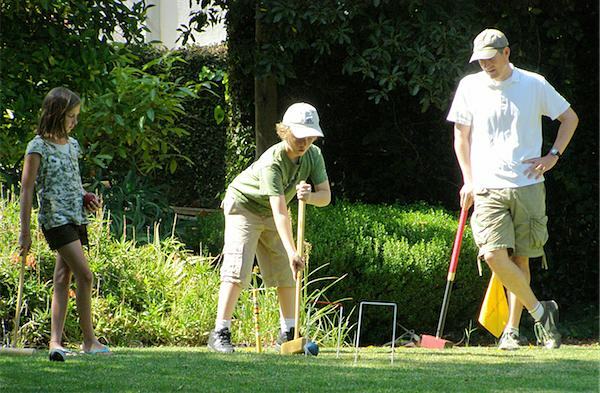 Shocking upsets were the theme of the 14th annual Lanterman House 9 Wicket Tournament. The event was played in the Los Angeles suburb of La Canada during the Memorial Day weekend, May 23–24, under the usual combination of early morning “June gloom” and late breaking sunshine in the afternoon. 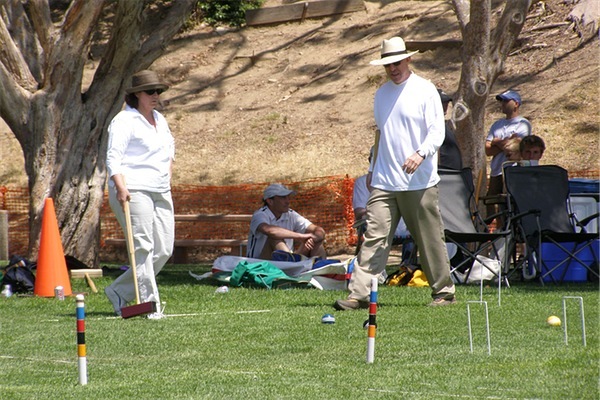 The preliminary rounds were played Saturday at Memorial Park during the La Canada Fiesta Days civic celebration, and the finals were played Sunday on the front lawn of the historic Lanterman House museum in front of a crowd of croquet enthusiasts and museum visitors. Divisions consisted of adult/adult doubles and adult/child doubles. Each division had a champions bracket (for past winners and very good players) and an open bracket (for other levels of experience). A total of 30 teams played, which was considered a good turn out, especially in light of the fact that the Memorial Day weekend came a week earlier this year, which took some folks by surprise. The greatest upsets were in the adult doubles champions bracket. Perennial champions Steve Del Guercio and Jim Kambe were upset in the semi-finals by Ed Therrien and Chris Del Guercio, who are both now in college. In the other semi-final game, John Therrien (father of Ed) and State Assemblyman Anthony Portantino beat past winners Caren and Eric Sawyer by just two wickets in a thriller. 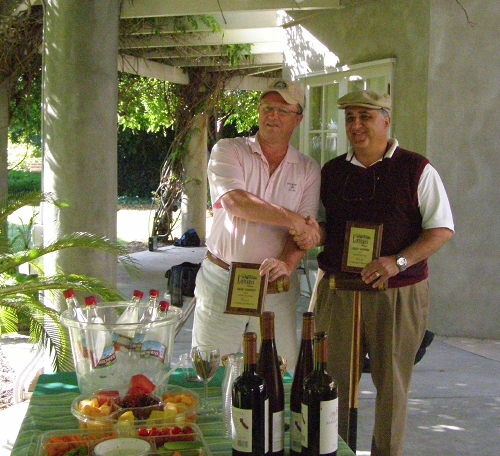 It was the first time in years that the Therrien/Portantino team beat the Sawyers. In the finals, John and Anthony handily beat Ed and Chris to win their first title in several years. In the adult doubles open bracket, the team of Lauren Kambe and Andy Evans upset a couple of higher seeded teams from neighboring South Pasadena (the Rasmussens and the Mitchells) to advance. But in the finals they ran into the experienced team of Scott Williams and John Sayre, who have won this bracket before. This year was no exception, as the Williams/Sayre team dominated the finals to win again. The adult/child champions bracket featured a surprise. 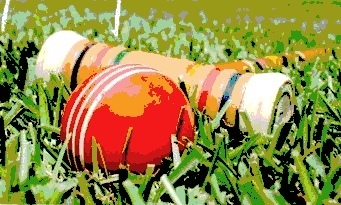 After round robin play among four teams, it was decided that the top three seeded teams would advance to the finals and play a game of six-ball. The father-daughter team of Jim and Lauren Kambe won the finals with 22 points. There was a tie for second between past champions David (father) and Lucas (son) Collins and defending champions Steve Del Guercio and his daughter Cami, with both teams scoring 17 points. This was an upset because it was the first victory for the Kambe team in this bracket. Finally, the adult/child open bracket final was a battle between two rival teams. 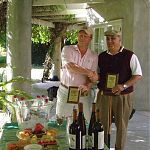 As reported in the local La Canada newspaper, the La Canada Valley Sun, the finals were “played and haggled over by Jim Kambe and his youngest daughter Vivian, and Eric Sawyer with family friend Ryan Ruiz. Things got a little tense over some rules of the game but all ended well with the winners being Eric Sawyer and Ryan Ruiz.” Last year, two of the Kambe daughters beat Ryan Ruiz and his father Chris, establishing the rivalry. 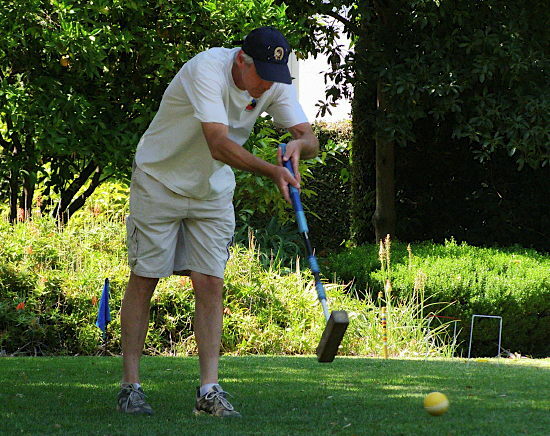 After the last match of the finals, a one shot peg-out from varying distances was played to raise money for the Lanterman House. 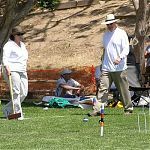 The two winners received $40 and $20, although Assemblyman Portantino, who won the $40 peg-out by hitting the peg from across the front lawn, graciously donated his prize back to the museum. 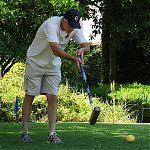 As always, the tournament is indebted to the Lanterman House Executive Director Melissa Patton; Bob Moses, who served as head referee; and the generosity of Mr. Richard Dewey of the Croquet Sport Company, who has donated croquet equipment to the tournament for many years.